Happy Monday, my dears! How was your weekend? Maybe some of you were traveling? Or sitting poolside? 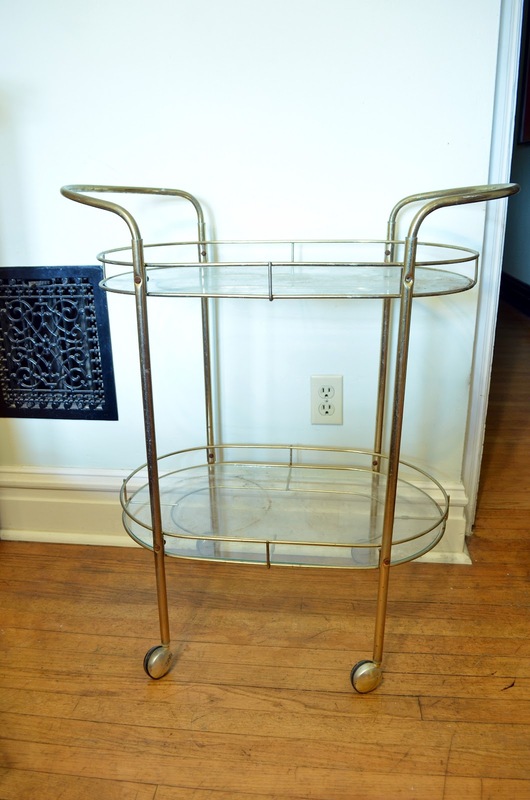 Or scoring some great finds around town? :) I did neither the first nor the second one, but on Sunday I found time to visit some estate sales, made even better by the fact that it was half-price day. My first stop was a sale in the city, not far from our house. Second was one in University City, followed by a trip to the Goodwill there on Olive, one more estate sale in South County, and then the Goodwill out off Highway 30 past Fenton, where I scored a ton of new Target clothing (and a pair of sandals) that I'll model for you this week (weather permitting...) as the beginning of what will hopefully be a weekly outfit post (eek). But today...today is all about the vintage goods. Shall we take a peek? 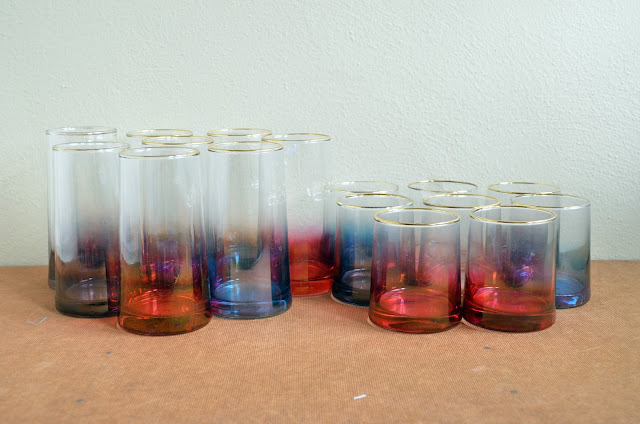 Two sets of 8 mid-century metallic ombre glasses...so pretty! 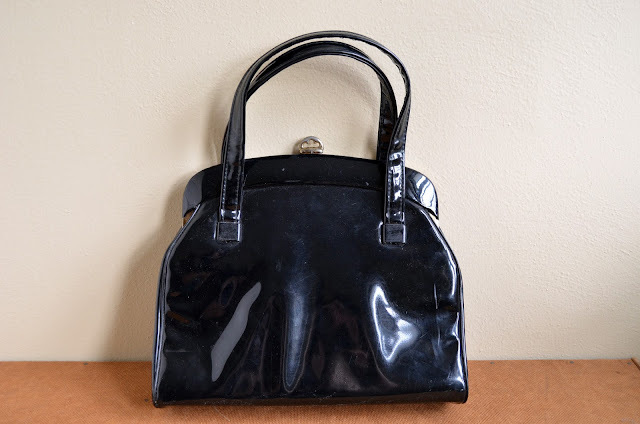 A lovely black patent purse that is pretty much pristine inside. Two yellow glass tea light holders...remind me of ones you see at Anthro. 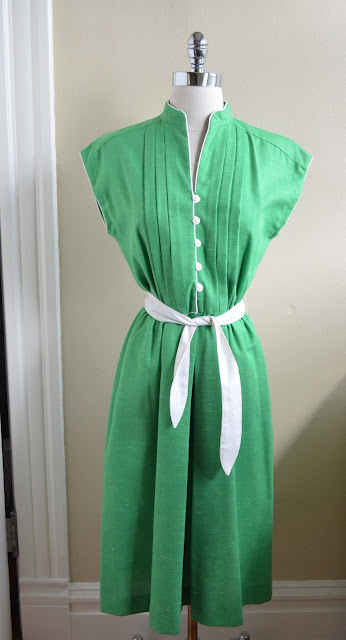 A vintage green dress with white buttons and piping and a white sash. going to try and work out. Was too cute and inexpensive not to take the risk! A really pretty lace tablecloth for our dining room. 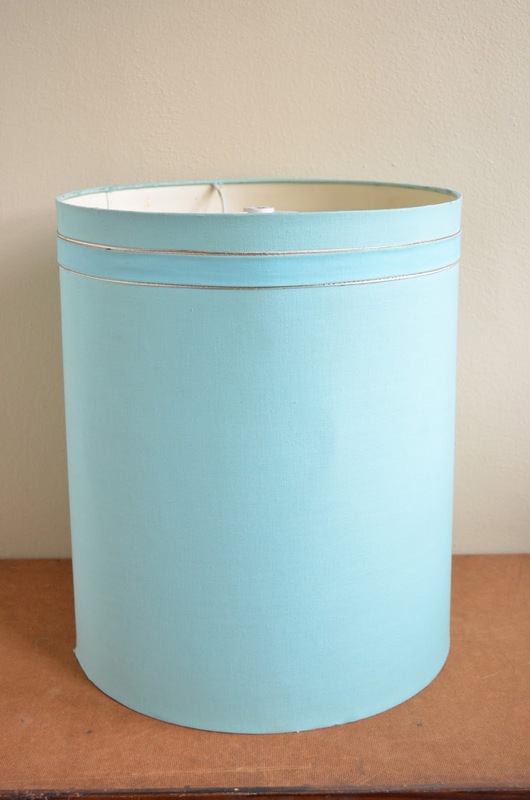 A pale blue lampshade with gold trim...perfect for that owl lamp that I'm painting this week! How about you, lads and ladies? 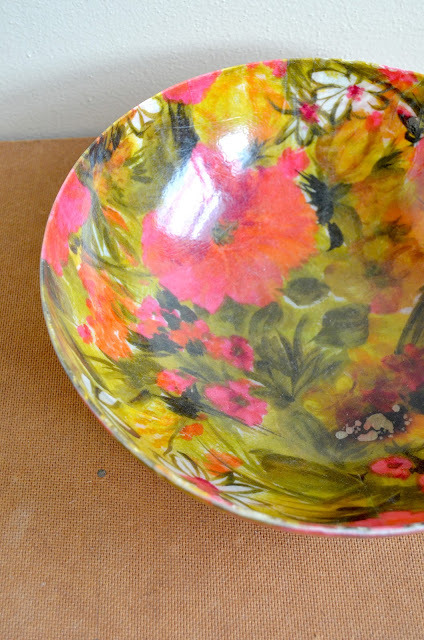 What goodies did you dig up on your treasure hunt this week? 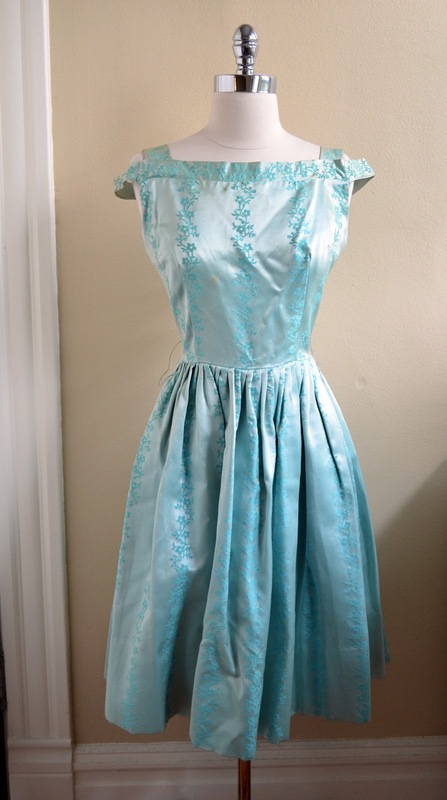 That blue dress is very Betty Draper isn't it! I was at the same sale that you got the glasses. I admired them in the cabinet. 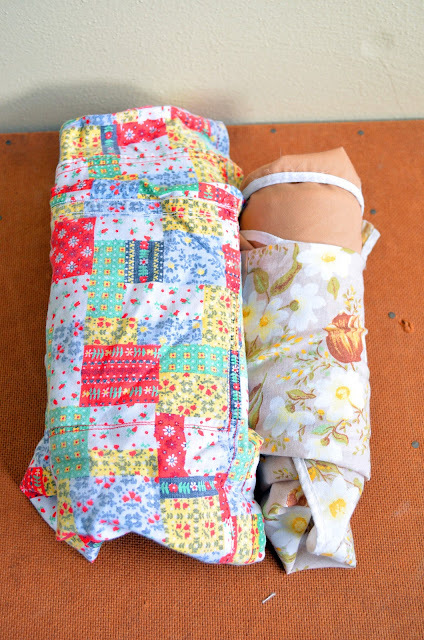 I'm glad they went to a good home! Wow, you really did get some amazing things. I love the glassware, the set of glasses really are unusual. The tablecloth is really pretty too. I am in awe of your treasure hunting abilities! Thank you for the kind words! Those glasses are pretty cool, huh? 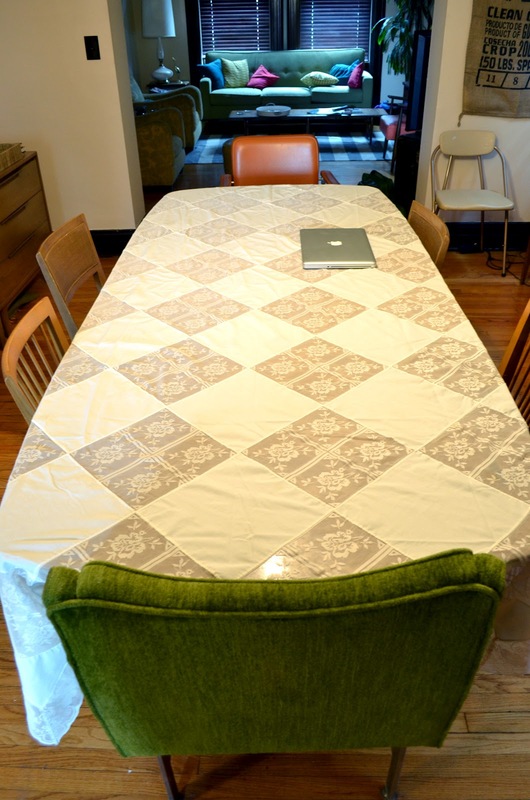 And we're loving the tablecloth. I hardly come across any big enough to drape it so well, so I'm really excited! Love the cocktail dress and the bar cart is a fabulous find! Thanks, Megan! I'm kind of surprised, too. I pick ones up that I rework a bit, but I don't think I'm going to change a thing about this one! Nice job! 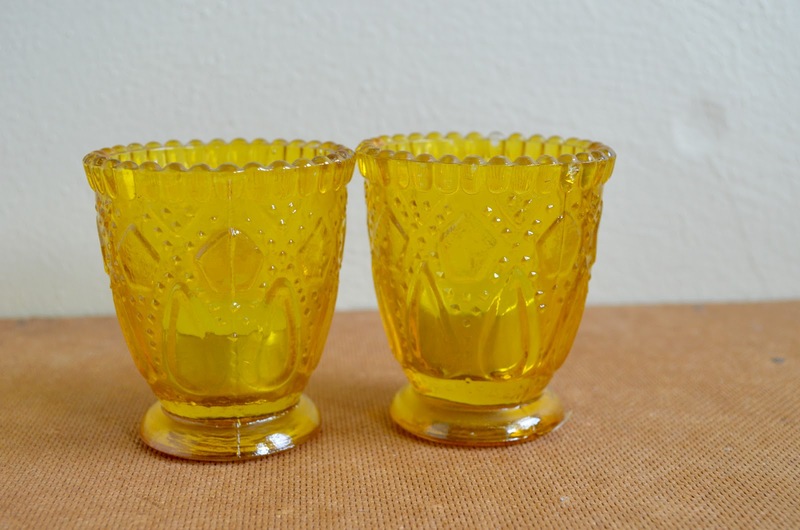 Many admirable items: the blue lamp shade, the ombre glasses, and those yellow votive holders are gorgeous. They look a little like hobnail. You have an excellent eye for treasures! The glassware is gorgeous and I love the dresses. Oh my gosh...Katie, that is SO funny!! They really are identical twins! Have you decided if you're going to paint yours? I think I'm leaving mine gold for right now, but we'll see how long that lasts. :) And thank you for the kind words! I am so glad you get some inspiration from my ramblings...it really truly is so wonderful to hear that. And yes, let me know if you need any thrift store recommendations next time you're in town!